Are there any other tea aficionados out there besides myself? Well, if so, I have the cutest craft for you. I went to a tea room last Saturday, and they had the cutest tea wallets, a trifold with six pockets for each tea bag. I thought about buying it, but the store wanted $12 for it. However, I thought I would try my hand at making it myself. 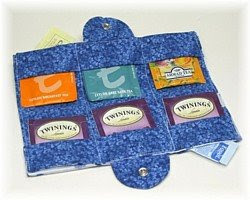 So I scoured the internet looking for a pattern for a tea wallet. I must have put in the in the wrong search criteria, because I couldn’t for the life of me find what I was looking for. I searched “tea holder” and got all kinds of results that didn’t really meet my needs. It is designed by Annelise Pitt, owner of Thistledown Cozies. If you wish to buy Ms. Pitt’s tea wallets or other tea accessories, you may purchase them at the Thistledown Cozies website. Thank you all for your feedback! I will try to post the tutorial by this weekend. You didn’t hear me gasp all the way from Austin, Texas, did you? YES, I am a tea freak and could use something like this when we take road trips (rare as they are these days because of gas prices). What a unique post! Thank you! Very cute, love the fabric! I am no tea drinker, but i am a lover of little cute bag/pouches like the one you made. Oh how neat! I’m looking forward to the tutorial; I want to make several of these. Cute indeed. I immediately thought of making this as a gift too for a friend who has to take her own tea with her all the time as a consequence of a illness. So looking forward to your tutorial too. That is really cute!! That would make a cute gift.When you post the tutorial for that I am going to make it for my mother. I LOVE this. I can’t wait for your tutorial.